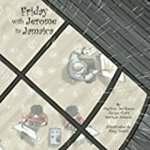 "Friday with Jerome in Jamaica" by Phylliss DelGreco, Jaclyn Roth et al. DelGreco, Phylliss; Roth, Jaclyn; and Silverio, Kathryn, "Friday with Jerome in Jamaica" (2013). DIVerse Families. 435.